← BYOB ! ………a Brixton…………. …..people often ask me. Well, in the case of Nether Edge 360…..
….. when a Greyhound walked past ! Almost complete, the painting just needed a little “something special”, when …..
…..at the cross-roads this morning, waiting for the traffic lights to change, in the very spot where there is the final space in the painting……. …..incredibly, a Sand-coloured Greyhound suddenly trotted across the crossing, in front of my very eyes ! …..Astonished ?? was I !!….. …..So, here he/she is now, in the completed Nether Edge 360 * (the Greyhound is painted from memory, I didn’t have time to sketch it as the lights were about to change) ….. 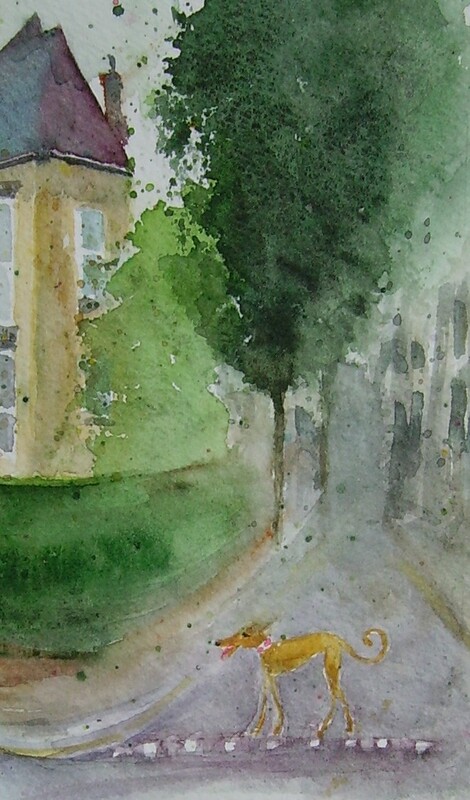 This entry was posted in Greyhounds, Sheffield - watercolours and tagged Farmers Market, Greyhound, Machon Bank, Moncrieffe Road, Nether Edge, Sheffield, Sheldon Road. Bookmark the permalink.